This posts continues looking through the book The Limits to Growth one chapter at a time, summarizing it and offering my thoughts on what it has to say. In my last post we stopped part way through Chapter IV, Technology And The Limits To Growth, having just looked at several runs of the World 3.0 model, each of which ended with a collapse of the world system as one sort of limit or another was reached. The rest of this chapter is spent discussing the implications of those model runs and some of the limitations of the model. One limitation is that once collapse starts, there will be significant social change and the model's structure will no longer match the structure of the world's systems. So the models "predictions" are valid only up until things start to fall apart. 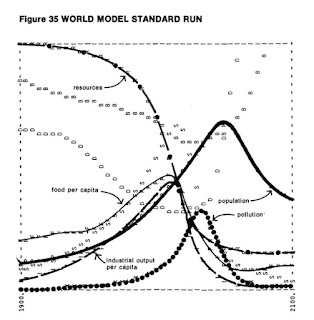 The model runs in this chapter make it clear that the basic behaviour mode of the world's system is exponential growth of population and capital followed by overshoot and collapse. This is so if we assume no change from the current system or numerous technological changes. All the model runs to this point assume that population and capital growth are allowed to continue until they reach some natural limit, since this seems to be a basic part of the current human value system. Using the most optimistic estimates of the effect of technology in the model did not prevent the ultimate decline of population and industry, nor even delay it past the year 2100. Delays are built into many of the feedback loops in the system, so that the effect of a change in one value is not felt immediately in other areas. The result of this is that a value which is approaching a limit will often actually overshoot that limit before collapsing. I'd like to point out that during the first part of an occurrence of overshoot, when population and industry are still growing, it is difficult to tell that overshoot is actually occurring. Only after they peak and start to decline does it become obvious that the system has actually been in overshoot for some time. This leads us to what is for me the essential question that comes out of The Limits to Growth: are we already in overshoot or are we just starting to do really well as the techno-optimists and cornucopians would have us believe. It should be no surprise that I believe we are well into overshoot and heading merrily along toward collapse. The authors go on to say that technological change has social effects that are not included in the model and that these effects often manifest themselves after a delay as well. This is unfortunate since we may commit to a technology and become dependent on it, only to find out too late that it has some negative social consequences, which we now have to live with since we have become dependent on the technology. As an example they point to the Green Revolution, which was intended to be a technological solution to the world's food problems. They claim it was also intended to be labour intensive so as to provide more jobs and not require large amounts of capital so as to be accessible to the poor in developing nations. In areas like the East Punjab in India this worked well—the number of agricultural jobs increasing faster than the rate of growth of the total population, with real wage increases of 16 percent from 1963 to 1968. The principal, or intended, effect of the Green Revolution—increased food production—seems to have been achieved. Unfortunately the social side-effects have not been entirely beneficial in most regions where the new seed varieties have been introduced. The Indian Punjab had, before the Green Revolution, a remarkably equitable system of land distribution. The more common pattern in the non-industrialized world is a wide range in land ownership, with most people working very small farms and a few people in possession of the vast majority of the land. Where these conditions of economic inequality already exist, the Green Revolution tends to cause widening inequality. Large farmers generally adopt the new methods first. They have the capital to do so and can afford to take the risk. Although the new seed varieties do not require tractor mechanization, they provide much economic incentive for mechanization, especially where multiple cropping requires a quick harvest and replanting. On large farms, simple economic considerations lead almost inevitably to the use of labor-displacing machinery and to the purchase of still more land! The ultimate effects of this socio-economic positive feedback loop are agricultural unemployment, increased migration to the city, and perhaps even increased malnutrition, since the poor and unemployed do not have the means to buy the newly produced food. I would add that the Green Revolution was intended not as a final solution, but rather to give us a breathing space while we got population growth under control. That hasn't yet happened, and the social problems caused by the Green Revolution haven't been solved, either. It is also becoming evident that the Green Revolution and conventional agriculture in general is pushing up against resource limits such as arable land, fresh water, fossil fuels and mineral resources like phosphorous. That is exactly what the model runs earlier in this chapter should lead us to expect—that the application of technology to apparent problems of resource depletion, pollution or food shortage has no impact on the essential problem, which is exponential growth in a finite and complex system. The social delays, like the physical ones, are becoming increasingly more critical because the processes of exponential growth are creating additional pressures at a faster and faster rate. The world population grew from 1 billion to 2 billion over a period of more than one hundred years. The third billion was added in 30 years and the world's population has had less than 20 years to prepare for its fourth billion. The fifth, sixth, and perhaps even seventh billions may arrive before the year 2000, less than 30 years from now. Although the rate of technological change has so far managed to keep up with this accelerated pace, mankind has made virtually no new discoveries to increase the rate of social (political, ethical, and cultural) change. They go on to discuss that there is a whole range of problems that cannot be solved by technological advances. Problems which yield only to social solutions. Applying technology to the natural pressures that the environment exerts against any growth process has been so successful in the past that a whole culture has evolved around the principle of fighting against limits rather than learning to live with them. This culture has been reinforced by the apparent immensity of the earth and its resources and by the relative smallness of man and his activities. The basic choice... is the same one that faces any society trying to overcome a natural limit with a new technology. Is it better to try to live within that limit by accepting a self-imposed restriction on growth? Or is it preferable to go on growing until some other natural limit arises, in the hope that at that time another technological leap will allow growth to continue still longer? For the last several hundred years human society has followed the second course so consistently and successfully that the first choice has been all but forgotten. Perhaps the best summary of our position is the motto of the Sierra Club: "Not blind opposition to progress, but opposition to blind progress." 1. What will be the side-effects, both physical and social, if this development is introduced on a large scale? 2. What social changes will be necessary before this development can be implemented properly, and how long will it take to achieve them ? 3. If the development is fully successful and removes some natural limit to growth, what limit will the growing system meet next? Will society prefer its pressures to the ones this development is designed to remove? Let us go on now to investigate nontechnical approaches for dealing with growth in a finite world. Answering those questions is likely to be difficult and such answers as we can get will not be terribly clear. But unfortunately, choosing not to adopt technology can also have severe consequences, as we'll see in the next chapter. This is a rather short post, but including Chapter 5 would make it too long, so I'll break off here and be back in just a few days with my review of Chapter 5, which is already written. The essential problem is not exponential growth in a finite system; the essential problem is agriculture. That's why the Green Revolution was a positive feedback to the system. Grow more food and more people survive to breeding age. They reproduce and so more food has to be grown to feed them and they survive to breed and so on. We started on the road to collapse when we left hunter-gathering to take up agriculture. The collapse has been several thousand years coming, but come it has. Great post, BTW. Glad you liked it, FoodnStuff. I guess the "essential" problem is all a matter of how you look at it. 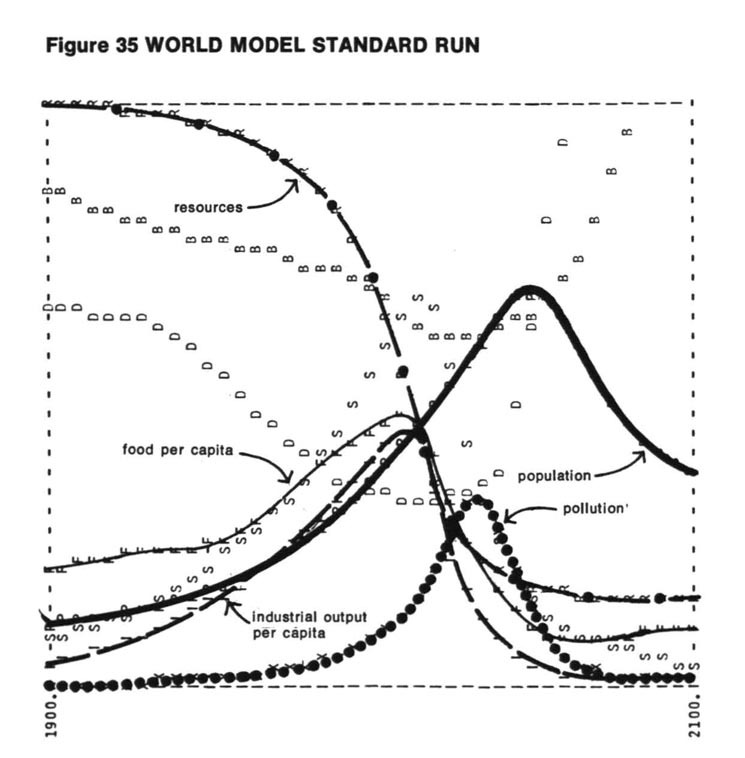 I find it interesting that in the next chapter of The Limits to Growth the first model run looks at what happens if we stop population growth. Industrial growth continues, of course, and services and food increase, providing everyone with a better life. For a while--then resource depletion and pollution cause another collapse. All because people are unwilling to take limits seriously, or so it seems to me. But is certainly is true that agriculture and population growth are (and have been) in an arms race, a vicious circle. Feed them and they will breed. But, as I've found out the hard way, we mustn't mention this in polite company. Have you read any of Daniel Quinn's books? Ishmael and it's sequels? He does a good job of discussing the damage we've done by leaving our original hunter-gatherer ways of living. He uses the term "totalitarian agriculture", which refers to agriculture on its way wiping out the rest of the ecosphere. 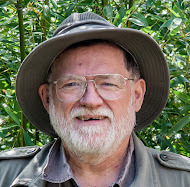 He leaves open the possibility that the fault is with civilization, not agriculture, and that it may be possible to practice agriculture on a smaller scale with fewer people and no growth. Moving not backward but not forward either, instead heading off in a totally new direction. I hope we will try this during the recovery from the collapse that is coming soon. If we don't we'll just grow ourselves right back into the same sort of mess. Yes, Irv, I've read all of Daniel Quinn. Ishmael blew me away when I first read it. I hadn't really thought of culture as being the problem; I'd been thinking that somehow humans must be flawed, but that didn't gell with evolution as producing what works and not what is flawed. I love the way Quinn turns normal thinking on it's head. I am planning to do reviews of a number of other books that have turned my thinking on it's head, hoping that this will be interesting to other folks as well. I had a look at your blog, foodnstuff. Nice cauliflowers. With a whole hectare of land you are likely better prepared than I am. I live on a small lot in a small town on Lake Huron, in a farming area, 100 plus miles from a city of any size. I'm working on networking with other folks around here, so I don't have to be totally self reliant. I am actively involved in the local Community Garden--what they call "allotments" in the UK, don;t know what you call it down under. I would certainly be interested in reviews of other books you've read, so go for it! While I am on a hectare of land, 80 % of that is natural bush, what we call remnant forest over here and there is a protective covenant on it that forbids it being cleared. The other 20 % is my food garden. I'm managing to grow about half of my fruit and vegetables on it. Yes, we have community gardens over here and that's what we call them, too. Thanks for your blog and for putting the time in to write such comprehensive posts.